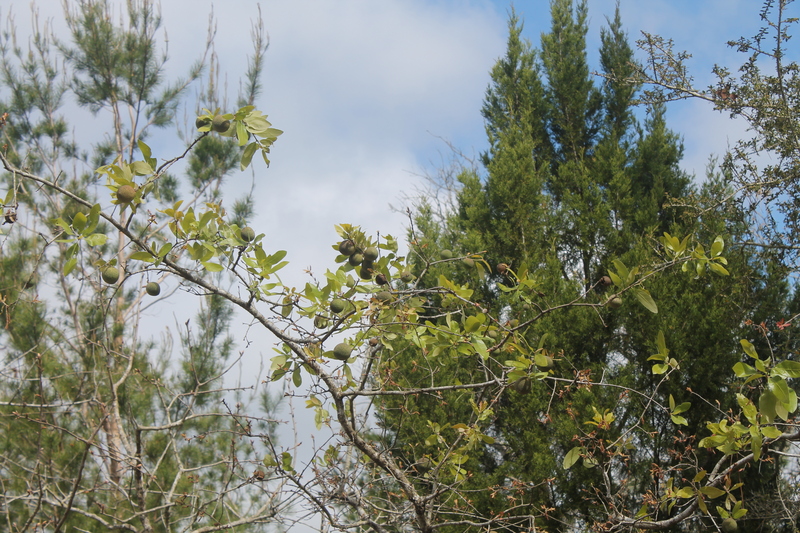 Gall caused by a wasp in the Cynipidae on Water Oak. Humans usually believe that we have a mastery of the natural world, and know everything about it. More often than not, nature tricks us with illusions that play on our pre-conceived notions about plant life. We are conditioned to believe that everything hanging from a tree must be a fruit or nut of some sort, so much so that a wasp gall hanging from a common water oak can change our perception of that plant, making us think that it is a rare or unusual species of plant we have never seen before. Several different species of wasps in the family Cynipidae (at least 50 different species in the continent of North America) produce fruit-like galls on various species of oaks, which are also known as oak apples. 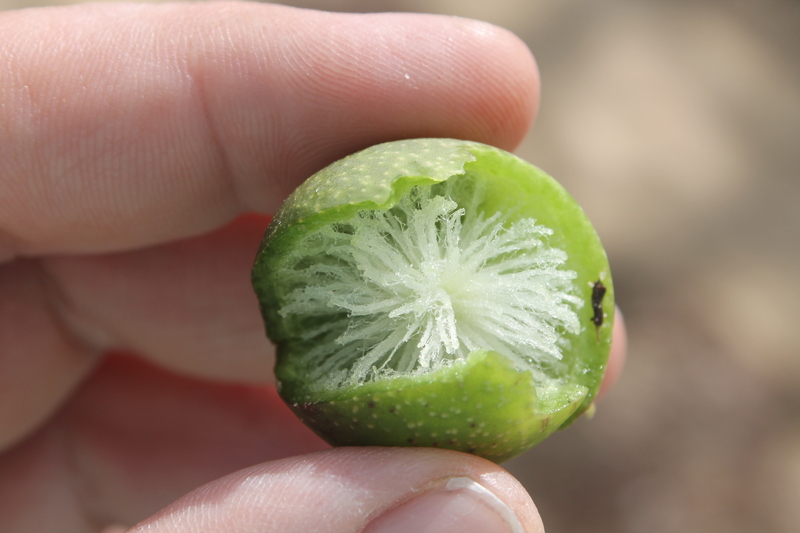 They are green or brown, depending on the species that created them, and largely hollow inside. When the wasp lays eggs on oak leaves, the eggs hatch and larvae cause the leaf tissue to be altered for their purposes. These galls provide shelter and nourishment for the developing larvae until they are ready to emerge and fly out of the center of the gall. It demonstrates a great survival strategy for an otherwise defenseless insect. The adult form of these wasps is no larger in diameter than the thickness of an old fashioned silver coin. 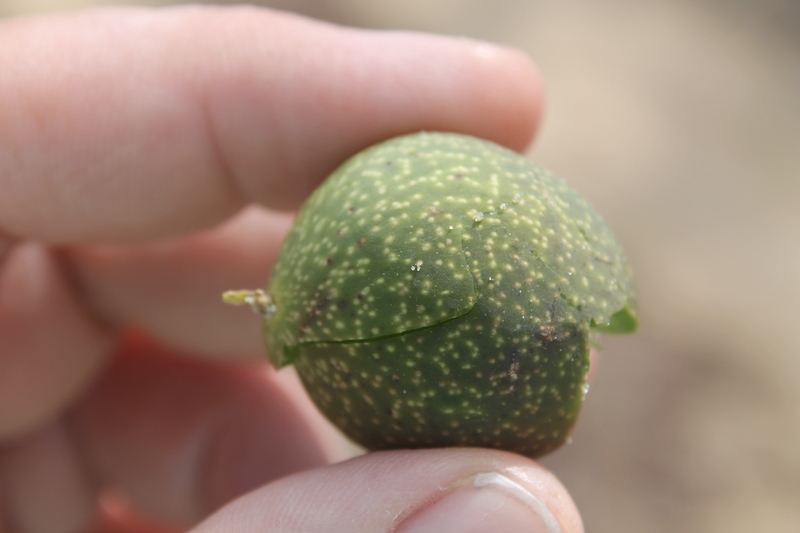 So, the next time you are out in nature and notice something unusual or out of place, it might be an insect gall!! Matthew J. Orwat started his career with UF / IFAS in 2011 and is the Horticulture Extension Agentfor Washington County Florida.His goal is to provide educational programming to meet the diverse needs of and provide solutions for homeowners and small farmers with ornamental, turf, fruit and vegetable gardening objectives. Please feel free to contact him with any questions you may have.